Can be caused by using a custom dictionary file, which was created in an earlier version of word. (or the custom.dic file is set to "Read Only"). 1. Click the Word "Start Button" > Proofing. 2. Locate the "When Correcting spelling in Microsoft Office programs". 3. 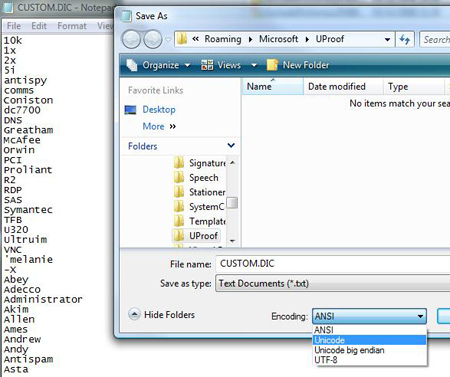 Click Custom dictionaries > Browse > This will show you the location of your custom.dic file. 4. Use Windows Explorer and navigate to this folder. 5. Open CUSTOM.DIC with notepad > File > save as > Change the encoding to Unicode. 6. Say yes when prompted to overwrite the file. Note: Also ensure that the custom.dic file has not been set as "Read only".